The Roman Empire was at its height during the time of the New Testament. The influence of Rome on its territories was vast and all-encompassing. From architecture and art to language and education, Rome had a tremendous impact on all of life. In order to better understand how the nation functioned and had such a powerful grip on their citizenry, it is helpful to do a short study of the hierarchy of the different social classes of people that made up the Roman Empire. There were three broad categories of people in the Roman Empire that everyone fell into: 1.) Citizens, 2.) Provincials (people they defeated), and 3.) Slaves. Be born into a family of Roman citizens. According to Roman law, all Roman Citizens were assured exclusion from all degrading forms of punishment. This law plays out often in the Paul stories in Acts. Next, let’s take a look at the classes of people that made up the citizenry of the Roman Empire. At the top of the hierarchy was of course, the emperor. However, there was only one of those, so actually the highest class was the rank of Senator. 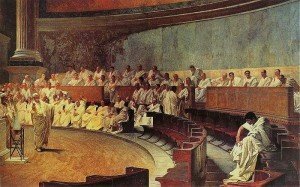 The word, “Senatus”, means old man or elder, so the Roman Senate was literally a council of elders. The Senate was made up of wealthy aristocrats that were either appointed by the emperor or they inherited their position. Although the Senate did not have lawmaking powers, they wielded considerable authority. They received and sent ambassadors and appointed provincial governors and Proconsuls to their posts. Pilate was appointed governor of Judea by the Roman Senate in 26 A.D. Other biblical examples of governors include Quirinius in Luke 2:2, Sergius Paulus in Acts 13:7, and Gallio in Acts 18:17. The Senate also sent recommendations to other branches of government and these recommendations were seldom ignored. To be a Senator you had to prove that you had property and money worth at least one million sesterces (a typical yearly income for the family was approximately 1,000 sestertii). There was no salary for the senatorial position and while a senator you could not engage personally in any trade, business or anything else that was non-agricultural. The next class below Senator was equestrian, originally a horse soldier. The basis for this class was strictly economic. You could be an equestrian if you could show that you had property worth at least 400,000 sesterces. By extension, your family members could also be equestrian if sufficient wealth could be shown. It has been recorded that families would choose to kill one of their newborns if they were afraid that by dividing the family inheritance, everyone might slip below the equestrian or senatorial rank. Equestrian could be involved in business, even the types that were off limits to the senators. Public display of status was very important in Roman Society. The clothing of the upper class had distinctive features which made them visible to all. You could tell what class you were in by the clothing that you wore. Only men of the upper senatorial rank could wear purple, usually robes with purple stripes. Some scholars suggest that Pontius Pilate, the Roman governor of Judea, would have been the only person at the Pratoreum in Jerusalem who would have had a robe with purple coloring that the Bible says was put on Jesus before his crucifixion. This finishes our brief look at the upper classes of the Roman hierarchy. In our next post, we will look at the lower classes and also look at the Roman soldier. As we learned in our study of the Shema, the Hebrew words, “b’khol” and “uve’khol”, are translated as “with all” and “and with all”, as in, Love the Lord your God, ”with all” your heart, “and with all” your soul, “and with all” your might. However the Hebrew word, ”uve’khol” packs an even bigger punch than its English translation. The following adaptation of an old Indian fable was given to me as a parable of sorts to explain what it means to do something with “uve’khol”. The story reminds me of how Jesus would explain something by saying, “The Kingdom of Heaven is like” and then tell a parable to explain God’s personality and His Kingdom. Listen and have ears to hear what the story has to say about loving the Lord with all your heart, soul, and might. In rural India, in the late nineteenth century, there lived a young man who was born into a poverty class and because of this was forced to beg for a living. The countryside was poor and the living meager for even those in the higher classes of people. Due to his position in life, the young man owned no land and had no means of support. His parents had died and left him alone and he was forced to live off the generosity of others. There was no currency to speak of, so the man carried a large cup with him and held it out to beg, hoping to receive grains of rice from his fellow villagers. He would station himself on the crossroads of the village tracks, hoping to catch the farmers as they came to and from the fields. On his best days, he might fill the cup half to three fourths full of rice to give him a meager meal for his supper. One day as the man sat in his customary position on the dirt tracks leading to town, he noticed some activity at the far end of the road that came towards the village. As he strained to look, a huge procession of people and animals began to take shape in the distance. He could see soldiers and flag bearers in their bright uniforms leading the way, and what came behind the soldiers caused his heart to leap in his chest! A procession of elephants was coming and that could only mean one thing! The Maharaja was coming to their village! The title, “Maharaja”, means, “ great king” and there was only one in the province! All the villagers had heard rumors about him, but no one had ever seen him in person. It was almost unbelievable that their great king was actually here and coming to their town! Quickly the beggar moved to a place in the road where they could not miss seeing him when the procession passed by. This was his once in a lifetime chance to actually receive something of value in his beggar’s cup. His quick actions put him at the front of the large crowd of people that had also spotted the procession and were gathering to witness the spectacle. Finally, the formation of soldiers reached the edge of the village and began passing by the beggar. Just as the lead elephant was approaching the man’s position, a command was shouted out for the elephants to stop. The man couldn’t believe his fortune! He was in the perfect spot! With another command the elephant went to his knees and the Maharaja dismounted. Surrounded by soldiers, the King moved toward the crowd. The beggar began to shout and frantically wave his cup, hoping to be noticed. The King spotted the beggar and walked directly toward him. Looking at the man’s cup, the Maharaja asked, “How much rice do you have?” This question was not at all what the man had expected and it caught him completely off guard. Why would the King want to know how much rice he had? He owned all the rice in the world! “Only half a cup, your Majesty!”, the man replied. “Well, your highness, this is all the rice I have to my name. I suppose you could have half of it”, the man dejectedly said. The Maharaja then took the cup, turned his back and poured out half the rice into a servant’s pouch. 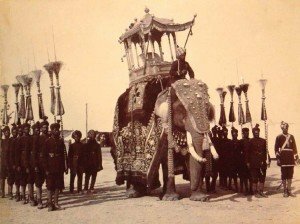 He then handed the cup back to the beggar and without another word, got back on his elephant and the command was given to leave. As quickly as it happened, it was just as quickly over. Utterly dejected, the man sat beside the road with his head in his hands. It had all happened so fast! His one chance for riches had come and gone so quickly! “What did I do wrong?”, he chastised himself. Finally, he forced himself to look into his cup to see how much rice was left and how much the King had actually taken. When he looked in the cup, his jaw dropped to his chest! For very grain of rice that the Maharajah had taken, he had left a golden nugget! In anguish, the beggar cried out,”If only I had given him everything! If we love the Lord with all our heart, and with all our soul, and with all our might, we can’t hold anything back! He wants it all, but promises so rich a reward in the process. We are the beggar without much to offer, but our King says, “Give me everything you’ve got!” Like the beggar, we are hesitant to let go! It seems too great a sacrifice and we want to hang on to what little pittance we have! Let’s give him everything we have and not look back-that is the definition of uve’khol! Shema!